The Billings Chamber of Commerce on Thursday celebrated small victories and some large defeats in the recently concluded legislative session. The biggest defeat was the failure of the chamber’s top legislative priority, a local-option sales tax, to get out of committee. Committee votes against two local-option sales tax bills included negative votes by Yellowstone County legislators. One of them, Roger Webb, R-Billings, said he was inundated with messages from constituents opposing the bill, according to a story by Chuck Johnson in the Bozeman Chronicle. Bill Cole, chairman of the Billings chamber, told members at a lunch meeting Thursday that it’s intellectually inconsistent to complain about big government then deny local voters a chance to decide the sales tax issue. During a question-and-answer session, Bob Wilmouth, president of Rocky Mountain College, said Thomas Jefferson would have been disappointed by the vote against the tax, which would have allowed Billings voters to decide whether to tax certain luxury goods to pay for infrastructure and capital improvements. When he addresses 186 new RMC graduates at commencement exercises on Saturday, Wilmouth said, it will be harder to deliver the message that he wants Rocky graduates to stay in or return to Billings without assurances that the city will invest in needed improvements and infrastructure. 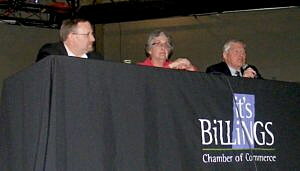 That issue was addressed by a panel consisting of two legislators, Sen. Mary McNally, D-Billings, and Rep. Don Jones, R-Billings, and by Ed Bartlett, lobbyist for the chamber, Yellowstone County and the city of Billings. McNally said that it often takes multiple sessions for bills to pass the Legislature and that voters must hold legislators accountable for their votes. “There will be people who will never vote for that,” she said. Jones added that the debate over local option sales taxes always turns into a debate over sales taxes in general. Some legislators argue that if the Legislature is going to consider a local-option tax, it might as well consider a statewide sales tax. The other major disappointment was the Legislature’s failure to pass a major infrastructure bill at the end of the session. A bill to take on $80 million in bonded indebtedness failed to get the two-thirds majority needed to pass, with Yellowstone County legislators casting enough no votes to defeat the legislation. The bill would have included $5 million for a new science building at Montana State University Billings. “You have conservatives who aren’t going to vote to go into debt,” McNally said. The Legislature appropriated $10 million for the science building in the 2013 session, with the restriction that local sources provide $5 million in matching funds. While similar matching requirements have been met by other campuses, such as MSU-Northern in Havre, Jones said, Billings has not been able to come up with the matching funds. Steve Arveschoug, executive director of Big Sky Economic Development, said Montana faces a workforce development crisis. Sixty-four percent of Yellowstone County businesses say they can’t grow because they can’t find the talent, he said. Industries look to relocate in communities that invest in local improvements, he said. “The feds aren’t going to write us a check,” Arveschoug said. McNally said the Legislature convened with about $79 million in reserve funds, instead of the $380 million that was there two years ago. The Legislature had to cut expenses and hold open unfilled state jobs, she said. Jones noted, “Every dollar was a fight to get.” Some legislators wanted to take the $10 million set aside for the Billings science building and use it for other purposes, he said. “Why isn’t Billings stepping forward and raising the $5 million?” he asked. After the chamber meeting, Sen. Margie MacDonald said there were enough votes at the end of the session to pass a bonding bill, but House Speaker Austin Knudsen would not bring the bill to a vote. “I don’t think Speaker Knudsen knows when he’s won,” she said. Kathy Aragon asked about the defeat of House Bill 442, which would have allowed a property tax exemption for public parks, such as John H. Dover Memorial Park on the Yellowstone River near Billings. The bill died on third reading on a tie vote in the Senate. “This is one bill that should have passed,” Bartlett said. Ron Larsen, interim chancellor at MSU Billings, offered to host meetings of the entire Yellowstone County delegation, which is the largest delegation in the Legislature, to get legislators to work together more closely. “We need to do more of that,” McNally said. On the positive side, the Legislature did pass some bills that reflect chamber priorities. Dan Brooks, government affairs manager for the chamber, said bills were passed to protect tax increment financing districts, to increase the state gasoline tax by 6 cents in 2023 and to add two district judges in Yellowstone County. Money for vocational education and legislation to comply with the federal Real ID Act also were approved. Bartlett added that a tax credit for employers offering apprenticeship programs also made it to the governor’s desk. McNally said, “These sessions are always a mix of the good, the bad and the ridiculous.” Legislation allowing the creation of new high school districts, which applies directly to Lockwood, was one of the good results, she said. The defeat of mail-in ballot legislation was among the bad results, she said, and as ridiculous she noted that Senate President Scott Sales had suggested a $25 tax on bicyclists using public roads. “It was a bit of a rant that got a lot of attention,” she said. MacDonald said that good legislation was passed to improve criminal justice, public safety and early childhood programs. “We tend to dwell on the donnybrook on the last day, but a lot of good work got done,” she said. In other business, chamber members noted the retirement of Bruce MacIntyre, senior public policy adviser. MacIntyre drew a standing ovation from the crowd.